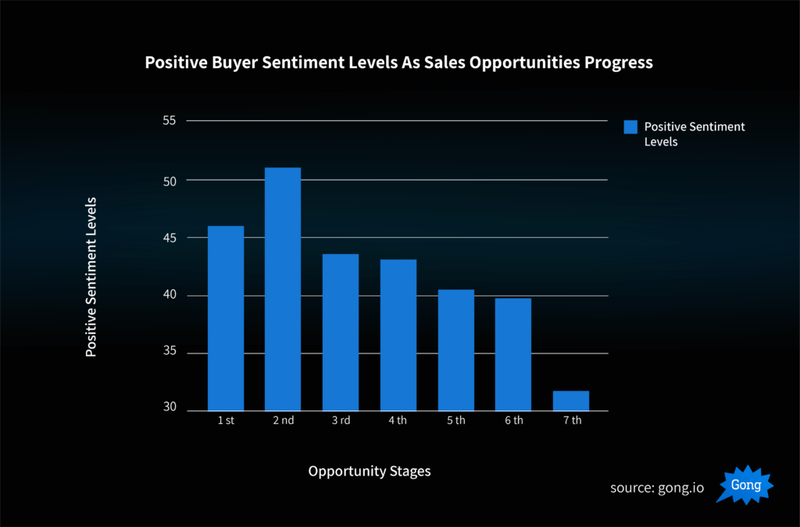 New research confirms that “happy ears” in sales isn’t just some cynical phrase that grizzled sales veterans toss around to poke fun at rookies–it’s actually a real phenomenon, now validated by data (see below). The data illustrates that when buyers respond to your sales presentation a little too enthusiastically (with few objections raised), they are actually less likely to buy. But as experienced sales professionals will attest to, when prospects respond to your demo in a way that seems too good to be true, it often is. If you’ve followed us at Gong.io, you know we publish data from analyzing sales calls with our AI-powered conversation intelligence platform to figure out what works (and what doesn’t) in sales conversations. All of these calls were transcribed, speaker separated to differentiate between the salesperson and the prospect, and tied to their CRM records so we could analyze this data against the outcome of the deal. Said another way, when buyers express concerns, objections, and otherwise “negative” conversation topics, it could actually be a positive signal for the deal. Closed-won deals, by contrast, have lower sentiment scores and more overall objections and concerns raised throughout the sales cycle. 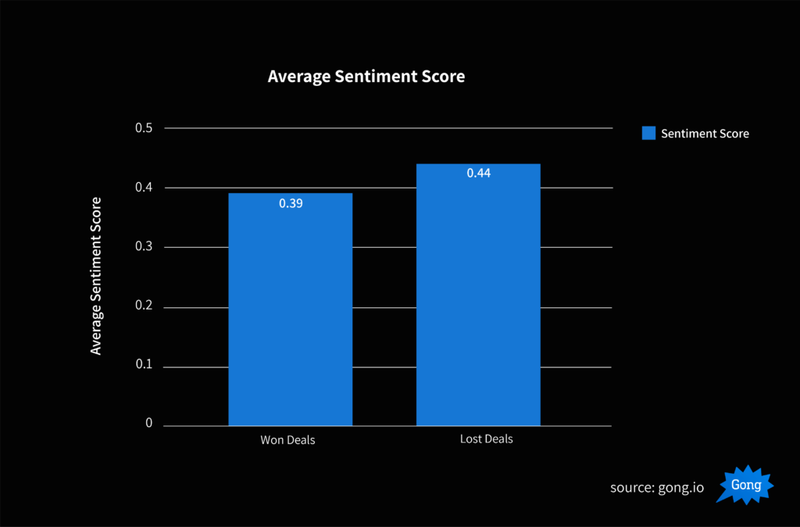 We also found that positive sentiment levels gradually but consistently decline as a deal progresses through each opportunity stage, drawing closer to the finish line. 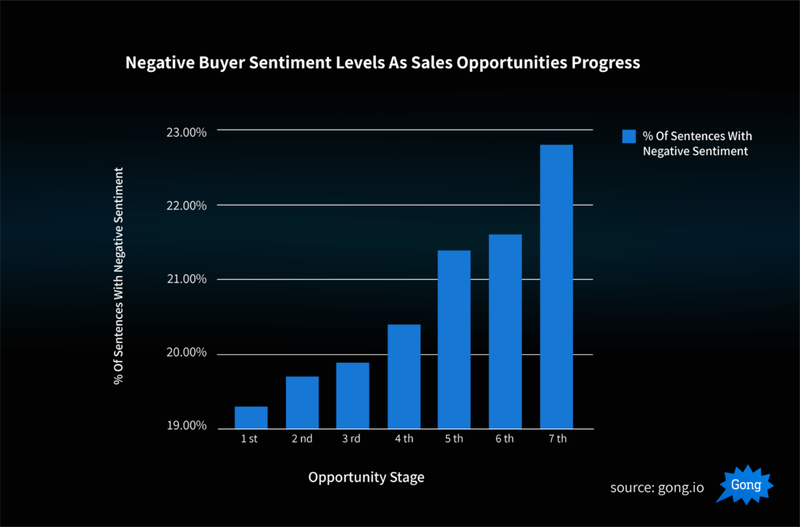 Notice that there is actually an increase in sentiment from the first to the second deal stage (possibly indicating that a presentation is delivered in the second stage, generating the buyer’s initial enthusiasm). More importantly: notice the sharp drop in positive sentiment during the final stage of the sales cycle, where the buyer and seller may be verbally wrestling with each other to come to a win/win agreement. The closer you get to closing the deal, the “grouchier” your buyer may come across. It’s important to not view this as a bad thing. If a buyer is drawing close to writing you a check and they seem to have nothing but concerns and objections, that’s actually a positive signal. They’re working through their final emotional hurdles before purchasing. Your job as a sales professional is to help them through those final concerns and emotional hurdles, not recoil from them. There are two actionable takeaways every sales professional should conclude from this data. First, if a buyer is expressing nothing but enthusiasm for your proposal, it may be a sign that you’re avoiding asking the tough questions. In these cases, you need to take the responsibility of actively surfacing the reservations, concerns, and obstacles your prospect has that they’ve failed to communicate on their own. Be the one to get them out in the open, if your buyer doesn’t express them without prompting. Don’t put the onus on them. It’s your deal to lose. If they remain trapped in the buyer’s head, they’ll remain unaddressed, acting as a silent landmine for your deal. Give that a try, if you’re not already doing something similar. Second, take note that the most serious buyers will become more concerned (not more excited) as you lead them through the sales cycle toward a purchase. This is a call for leadership, not concern. A sales amateur will recoil in the face of this reaction with shaken confidence, unsure of what to do. A sales professional will see this as his or her opportunity to help the buyer through their final emotional hurdles by using empathy, leadership, and listening skills. Well, there’s your weekly dose of sales data, along with the takeaways for you to put into action. Feel free to tell me your thoughts in the comments below. Did this data confirm what you’ve experienced in your sales career?